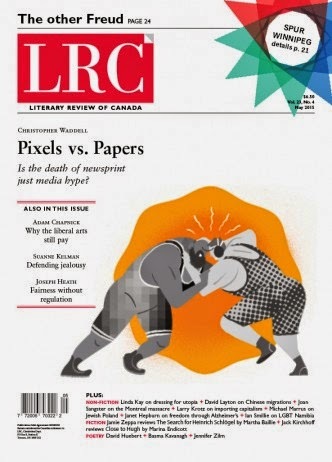 The Literary Review of Canada has published a review by Carleton University professor Christopher Waddell of my book that is complimentary but disagrees with my conclusion that newspapers will survive their current downsizing. “Greatly Exaggerated is a well-researched and well-explained story of how the newspaper business changed in the second half of the 20th and into the 21st century,” he writes. “Edge is correct that newspapers have survived and, despite the predictions of their imminent demise, have made a profit on their operations.” While agreeing with my findings of fact, however, Waddell comes to the opposite conclusion. Their ability to consistently generate profits despite plummeting revenues, he writes, does not necessarily ensure the survival of newspapers. That hardly guarantees them a long future. Complacently extending Edge’s story into the near future is a recipe for disillusionment. In fact, what is greatly exaggerated is just the short time frame for the death of newspapers, not the end result. While Waddell’s review, which is the LRC’s cover story for its May issue, is available on its website, the reply its editor Mark Lovewell invited me to write is not. [Edit: It now is.] That’s why I am posting it on this blog. The past, as Christopher Waddell observes, is an imperfect guide to the future. Understanding what happened in the past and why, however, is the best guide we have to what will happen in the future, because it aids in understanding the present and the processes that shaped it and will likely continue to shape the future. The economics of newspapers, which are incredibly arcane, must also be understood before their fate can be foreseen. Because of their unique “dual market” nature, they sell their product to consumers at a fraction of its cost to produce, which is subsidized by advertisers. With the enormous post-war bubble in advertising, newspapers came to rely disproportionately on advertising revenue, which by the recent financial crisis comprised 87 percent of their total revenues in the U.S. and 77 percent in Canada. As newspapers rearrange their business model, readers are finding they now have to pay higher hard copy prices and increasingly also have to pay for online access. Professor Waddell argues that recent job cuts have led to an emaciated print product for which many do not care to pay more. A vicious circle caused by cuts, he argues, leads to defections by both readers and advertisers. This seems a chicken-egg argument, as it was the defection of readers and advertisers that first prompted cuts. Their demonstrated ability to downsize, however, is one of the things that will save newspapers. In the lingo of techies, they are scalable, or easily made larger or smaller. Luckily, as Professor Waddell notes, newspapers seem to have finally caught on to what it is that readers want and cannot get elsewhere, which is local news coverage. His other argument is that young people don’t read newspapers and have found other online sources of news, so the supply of newspaper readers will eventually dry up. Young people have never taken much interest in the news, however, at least not in the type of news that newspapers tend to cover. It is only when they grow up, get married, take out mortgages, and start families that they start to wonder about things like schools, taxes, politics, and the economy. Newspapers are still by far the largest newsgathering organizations in their communities. The widespread implementation of paywalls, which is the other thing that will save newspapers, means that if people want the news that newspapers provide (and they do), they will have to pay for it, one way or the other.